A strike in Terrace in 1981 was an important precursor and milestone in the journey to achieve full collective bargaining rights for teachers. By Janet Nicol, published by the BC Labour Heritage Centre. Ken Novakowski frames the successful illegal strike of 2005 in the context of other times that it was necessary for the BCTF to take a drastic action in response to government actions harmful to education and to teachers. 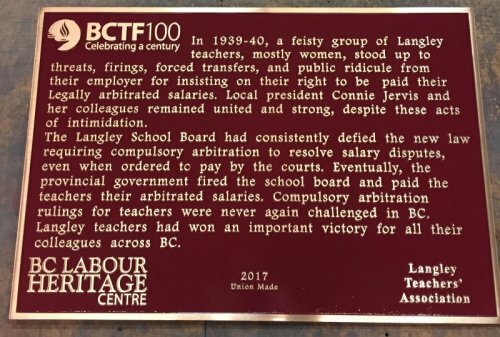 Gaining the right to arbitration was a result of struggle by women in Langley under the leadership of Connie Jervis, as told in this video from The Knowledge Network and the Labour Heritage Society. Scroll down page to view Connie Jervis video. Marcy Toms writes about an elementary teacher from Langley who, with colleagues, stood up to the school board when it refused to accept the decision of an arbitration board on teacher salaries. The result was a change in the law, forcing school districts to implement the rulings of arbitration boards. Ken Novakowski says "It happened in 1987. B.C. teachers gained full collective bargaining rights. And the grantor was a most unlikely politician—Social Credit Premier Bill Vander Zalm." Ken Novakowski outlines key events in the development of the BCTF's ability to bargain the salaries of teachers. He focuses on the New Westminster strike of 1921 and the Langley dispute in 1939-40. British Columbia is in an intensified period of curriculum change. But is it new? Ken Novakowski outlines a history of the BCTF's engagement in the development in the provincial curriculum. The article is from 2006, before the significant contribution of BCTF appointed teachers in the curriculum changes that started in 2014. The BCTF played a key role in capturing the ideas of the 1960s that would frame education development in BC over the next decade, in particular. While most “commissions” on education have had government’s official stamp, the BCTF commission in 1968 broke the pattern. Four teachers and BCTF staff traveled the province and received hundreds of oral and written submissions about where education should go in the future. Produced in 1984 by Barna-Alper Productions, National Union of Provincial Government Employees and Operation Solidarity. This video tells to story of the 1983 Solidarity strike in BC. Labour historian, Andy Hanson, presented this paper about Solidarity at the conference of the Canadian History of Education Association in 2016. Hanson is writing a history of the BCTF. Ken Novakowski looks at the impact on the BCTF of Operation Solidarity and the strike in 1983 on the development of the BCTF and protecting the rights of teachers. This is a 3-minute video produced by the Labour Heritage Centre and the Knowledge Network about the Solidarity movement. Scroll to the end of the page to view Solidarity. Ken Novakowski writes about what he saw as "the most significant week of BCTF history in our lifetime." The BCTF played an important role in a public sector strike, with both gains and challenges.